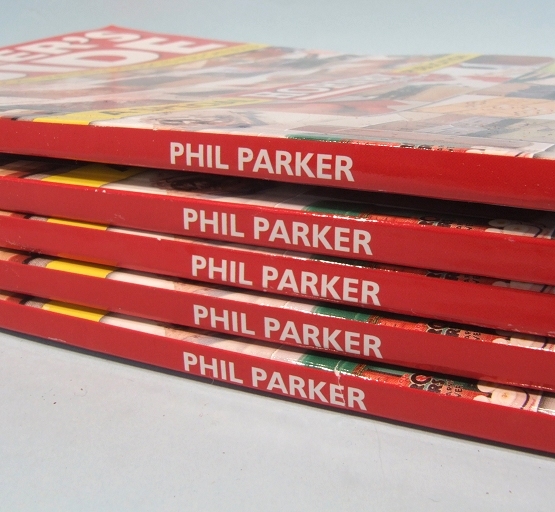 Phil: …I realised that my name was on the spine of the bookazine. I don’t know whether this is interesting or not, but getting properly published doesn’t quite feel like I thought it would. The thing is, I first pitched this project 18 months ago. Since the initial acceptance, I’ve been living with it every day. Even when I’ve been working somewhere in a “proper” job, the bookazine has been floating around the back of my mind. When we reached the date on my calendar marked “Delivered from the printer”, I was excited. Think 5 year old waiting to open his Christmas pressie and you get the idea. A pessimist to my core, I simply couldn’t believe that this would actually come off until I held a copy in my hand. When I did, I tried to casually flick through the pages as though it was the most natural thing in the world and I wasn’t really bothered. Which was easy as I just didn’t get the thrill I’d expected. It’s not that I was disappointed, far from it, it was just a bit “Ho hum. It looks like the proofs I’ve been reading”. Not nearly as special as I had thought. It’s all over and pretty much forgotten. Writing, it appears, is work. Proper, normal work. Pretty boring in places – re-reading the same chapter repeatedly to try to untangle a bit of text requires a serious effort to maintain concentration – nothing like the air-fairy creative process most people envisage. In this case a couple of times that concentration slipped and mistakes made it through to the page. John Scalzi summed it up in an interesting way last month by saying that he was grinding out the last few thousand words of his novel. He’d reached the point where he knew what was going to happen, it just needed turning into words on a screen. I think this is the stage The Book is at. We know the plot. We’ve written the first draft. We’ve messed around with it. Now we have to do the bit no-one knows about when they think about writing and beat the thing into a sharper, better defined shape. That’s not nearly as much fun as writing the first version of the story, but it’s a hurdle that we have to get over. If we don’t, we’ll be left with all the other wannabee writers who also couldn’t take the next step. Anyway, you will be pleased that I eventually did get a bit of a thrill from publication and it was when I saw my name on the spine. I didn’t spot this until 2 days after I’d bought a copy (Yes, I blagged some free ones but buying your book from a proper shop is exciting), it wasn’t expected, this is really just a fat magazine after all and a spin-off from another magazine so I assumed that it would be the mothermag name on there. It is, but so is mine. It’s only a minor triumph but it give me hope that we can manage the much greater success of being paid to write something that only ever existed in our heads. Once that one is heading to the printers, I will be like a 5 year old waiting for Christmas expecting a really big Lego model to be under the tree. And now, I promise, I’ll shut up about it.